BJ Baldwin off the leash in Baja. Ah, the King Of The Hammers. Easily my favorite off-road racing experience to watch. Or at least, the most immersive. Where else can you see high-speed desert action and rock crawling at the same event, from your tailgate? Well, this year KOH week is going to be wilder than ever. Today Ultra 4 Racing announced that in addition to the motorcycles, UTVs and multitude of truck types that invade Johnson Valley, California every February, the 2019 King Of The Hammers week will feature unlimited open-desert truck racing starring pretty much the most elite drivers in the sport right now. Rob MacCachren, Tavo Vildosola, Robby Gordon, Andy McMillin, Bryce Menzies, BJ Baldwin, Troy Herbst, Justin Lofton and Cameron Steele are all slated to show up and throw down in very fast trucks with a lot of suspension travel. Let me back up a little for those who may be understandably confused. 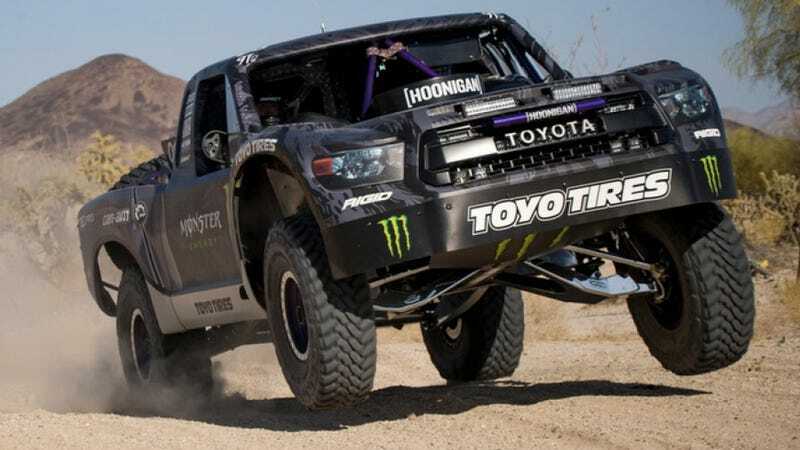 Every year, thousands of off-road fans descend upon a huge tract of wasteland about three hours east of Los Angeles for what’s known as “Hammerweek.” It’s kind of like Shark Week, but the ocean is sand and the sharks are trucks. Over the course of Hammerweek, a temporary city of trailers and trucks called “Hammertown” is erected where people party and look at car parts and talk racing. Speaking of racing, every day of the week hosts an off-road race over the rocks and sand washes of the region, culminating in the final event that is The King Of The Hammers. That’s where Ultra4 cars, which are basically four-wheel drive V8s with 40-inch tires, fight each other for a full day around a punishing course. I love it so much that I fail to get any reporting done every time I go: it’s way too much fun to blast around in your own vehicle going from one spectator spot to another. If you can handle living in a sand patch for a whole week, you could pretty much see all the coolest kinds of off-road racing right in your face. Or, if you’d rather enjoy it from the comfort of corporate air conditioning, you can usually livestream it which we’ll talk more about closer to February. Anyway, most races during Hammerweek incorporate rock crawling and fast driving over desert. But 2019 will be the first time you’ll get to see pure desert trucks, built for speed over soft stuff, absolutely rip and that fact that so many star drivers are already signed up means we’re definitely going to get a good show. All those pro level desert truck driving dudes are normally running in SCORE events (Baja) or Best In The Desert (Mint 400, Vegas To Reno) which are fun but a little more challenging to spectate. The Hammers will be a unique opportunity to see these drivers up close and personal, conveniently less than half a day’s drive from LA. I’m stoked as hell for this. I might have block off the whole week to soak it all up. Stay tuned for more updates as we get closer to race day in February.